Children who are 4 years old by September 1st are eligible for the state VPK program. By meeting the requirements (proof of residency and birth certificate showing your child will be 4 on or before September 1), the voucher issued by the Early Learning Coalition enables a child to attend our five day per week, 8:30 am. to 11:30 a.m. half day program at no cost to the parent. We offer a full day program (8:30 a.m. – 3:30 p.m.) for 4 year old children with VPK paying the morning portion and the parent paying the wrap around fee of $130.00 per week. There is no registration fee for the VPK half day program. There is a $125 registration fee for the VPK full day program. There is no supply fee for either VPK program. We invite you to stop by and tour our school. The school office is open 8:00 a.m. to 4:00 p.m., Monday through Friday. If you would like information regarding enrollment for the current school year, please contact the school office at 561-276-5552. 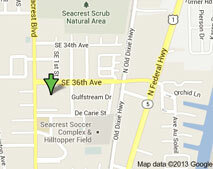 We appreciate your interest in Seacrest Christian Preschool.